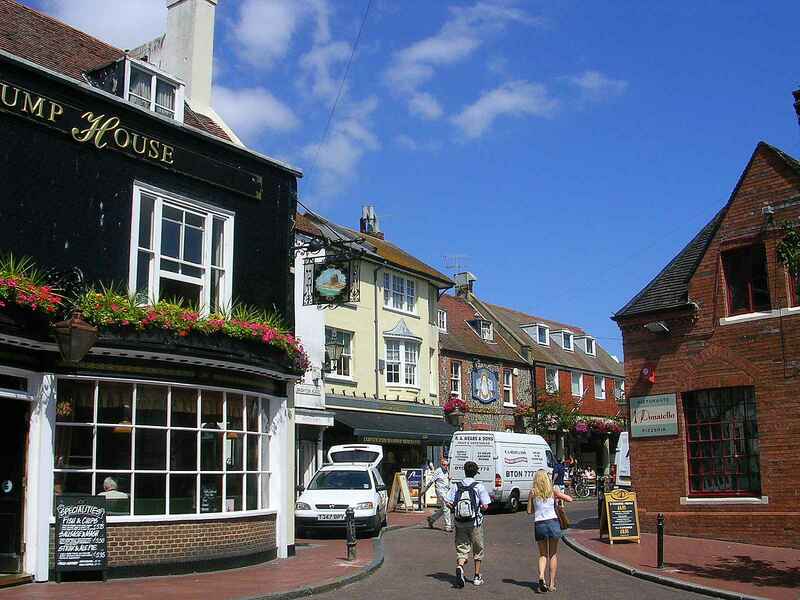 This page provides a glimpse into the Brighton Lanes shopping area and some useful information links. The Google Brighton Lanes map below shows the basic Lanes layout between Kings Road and North Street, from the Old Steine to West Street. Part of the fun of visiting Brighton is walking through the lanes and finding the backstreet stores and boutiques. You never quite know what you will find? In2clicks.com is the home the original Brighton lanes picture as seen in Google Earth. The pictures was taken on July 13th 2006 with a Nikon E3200 Camera while I was sitting outside the Brighton Lanes Starbucks (Favorite Starbucks) drinking a latte and eating a bran muffin. Others have tried to reproduce this scene, and it is currently being used by at least one other travel site without permission. You are welcome to copy this picture, but if it's on a website it be must attributed to www.in2clicks.com and a back link added to www.in2clicks.com. Not to do this is theft and can result in a copyright infringement claim. If your are looking for somewhere to eat? English's has had the reputation of being one of Brighton's best restaurants. If you prefer a view of Brighton beach then due south may be a better choice. Alternatively, just a short walk from the lanes to the east of the Brighton Pier on Madeira drive is the Terraces Bar & Grill with great views of the beach. All are listed in the website links. Don't forget to book in advance! The Google Street view below provides a taste of what the lanes have to offer visitors. For more information about Brighton look at the Visit Brighton website. If you find something you like, don't forget to tweet it.